This gal lives up to her name - has an absolutely regal presence. 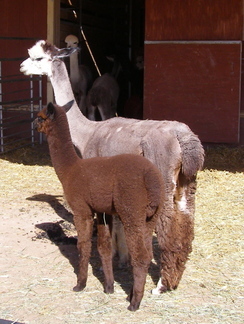 Princess is a gorgeous female with great fiber characteristics, very correct conformation and a very impressive pedigree. She produces beautiful babies, easy to breed, easy births. Altair's Vito - a champion in his own right, producing champion offspring, some of which are producing champion offspring. Vito usually throws the color of the dam - not always, but often enough that we think this could be interesting. Que Sera's Cimarron - a gorgeous young male - 1 championship and two reserves - a Vito grandson, rich brown fleece - super fine and dense - lovely conformation - a great match.